"This is a great way to use left over rhubarb sauce. 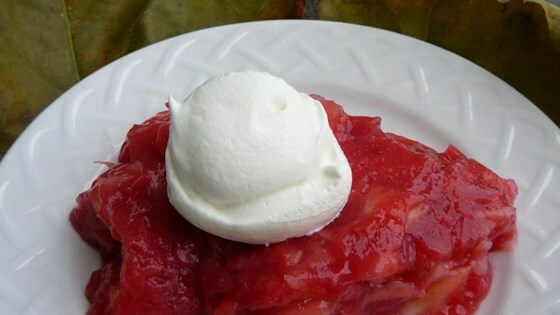 Your kids may not even know rhubarb is a key ingredient. Excellent salad with poultry. Another serving suggestion: Make in 9x13 cut in squares and serve topped with your favorite chicken salad." In a saucepan over medium heat, combine the rhubarb, sugar, and 2 tablespoons water. Bring to a boil, and cook for about 15 minutes, or until rhubarb is mushy. Mix well to form a sauce. Taste, and adjust sugar if needed. Reserve 1 cup. Save any extra for other uses. In a medium bowl, stir together the raspberry flavored gelatin and 1 cup of the boiling hot rhubarb mixture until completely dissolved. Stir in 1 cup cold water, then mix in the apples and walnuts. Pour into a serving bowl, and refrigerate for 2 to 4 hours, or until set. Garnish with whipped topping or creamy salad dressing before serving if you like. See how to make a fun and colorful dessert salad in a Jell-O mold. This tastes very good & refreshing. I used strawberry instead of raspberry because that's what I had. Even if you aren't crazy about rhubarb you will probably like this. I wanted to like this, I don’t. This is my favorite jello salad of all time. Even people who don't like rhubarb like this. A wonderful way to use rhubarb. I am diabetic so I used a sugar substitute and sugar-free gelatin. It was delicious!